It’s time to talk TMB. “Why?” Even my good friends ask. Don’t they know me by now? “How?” Says a cousin. Yes, the logistics are tricky but aren’t they always? “When?” Says a friend in a text message. And now the answer is: Only three weeks away. Let me back up. You already know that John and I have a promise to go to a new country every year. But a few years ago we added a spin to it. On our aughts and fives, we like to add a big adventure to our travels. For my 40th we hiked the Inca Trail to Macchu Pichu. And for John’s 45th we climbed Kilimanjaro. So guess who is turning 45 this year? Deciding what to do was pretty easy. We had been quietly looking at the Tour du Mont Blanc route for a few years, but for me his comment cemented our plans. I started researching the route, ways to complete it, and outfitters. We chose a British company called Run the Wild and asked if they could plan a six day run. Then we asked friends to join us, and voila! We got the ball rolling. Here are the specifics of the run itself. It totals 105 miles with 31,583 foot gain. We average 17 miles a day. The outfitters feed us and take our luggage from inn to inn. We just have to wake up, run, eat, repeat. 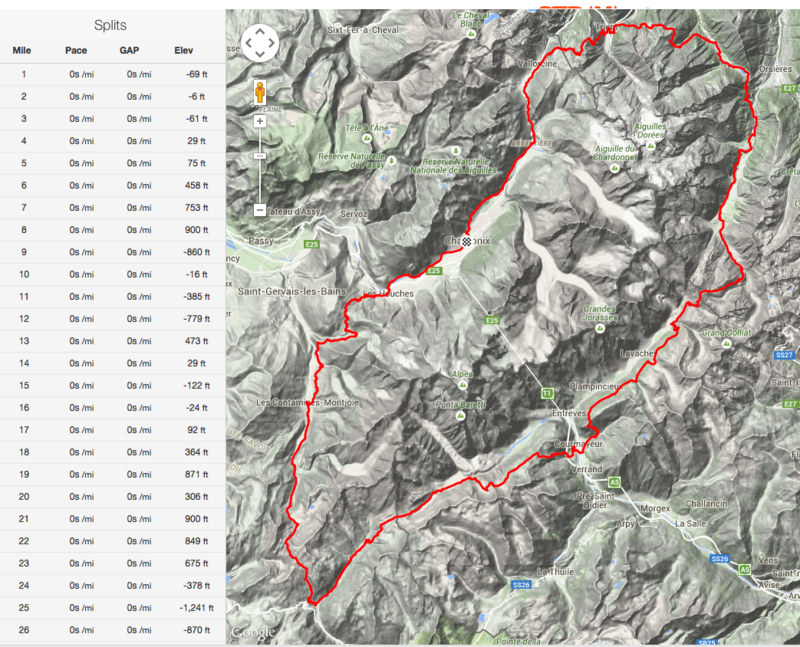 Here is the profile of the run (in meters). We will be starting and ending our journey at Hotel Les Aiglons in Chamonix France. Along the way we will stay at five other mountain inns: Hotel Gai Soleil in Les Contamines France, Auberge de la Nova in Les Chapeaux France, Albergo Edelweiss in Courmayer Italy, Auberge des Glaciers in La Fouly Switzerland, and Hotel La Grand Ourse in Trient Switzerland. We finish back in Chamonix on Bastille Day. So as you might imagine, the training is ramping up. 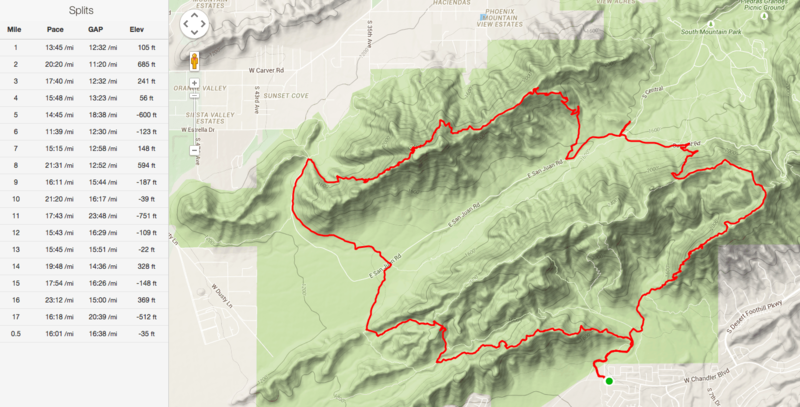 My training has taken place mostly at the west end of South Mountain Park on a set of trails including Pyramid, Busera, National, Bajada, and Alta. 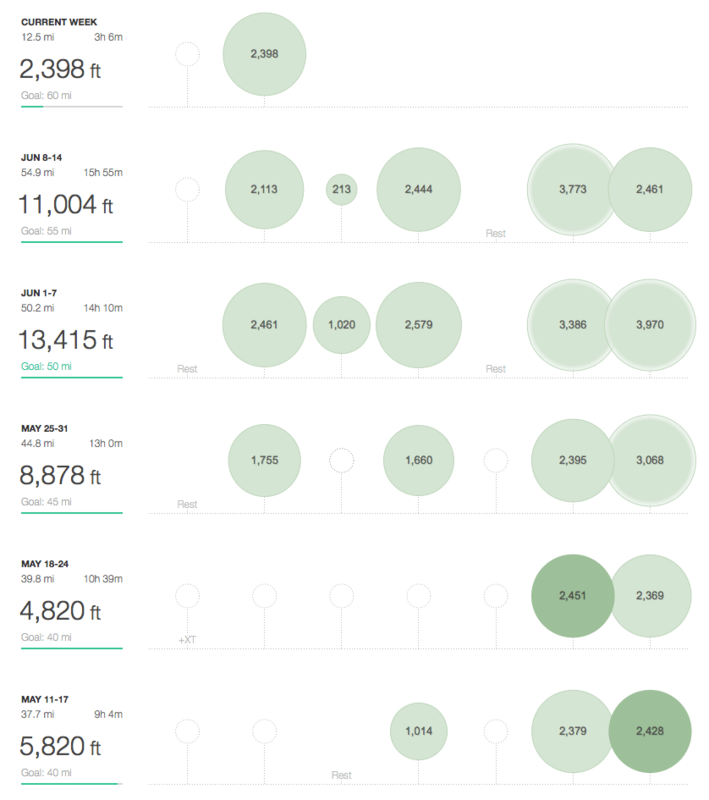 I’ve been increasing distance and elevation each week to try to match some of our days on the run itself. 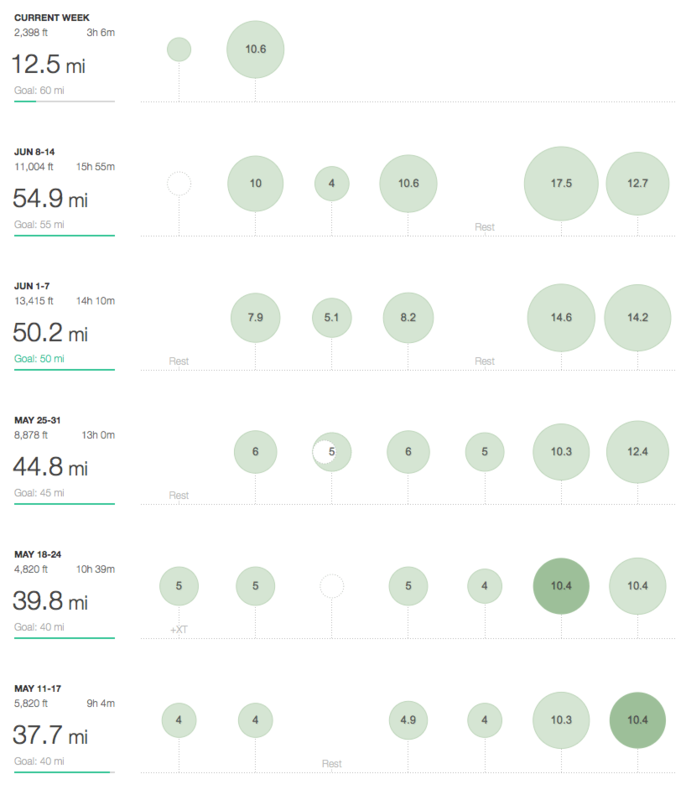 Here is my mileage for the last five weeks (I will run 60 miles total to finish out the current week). Here is a great Google Earth view of the route we will run. I’m hoping to be able to write along the route, but at the very least I’ll be posting pics of our trails, our meals, and our smiles.